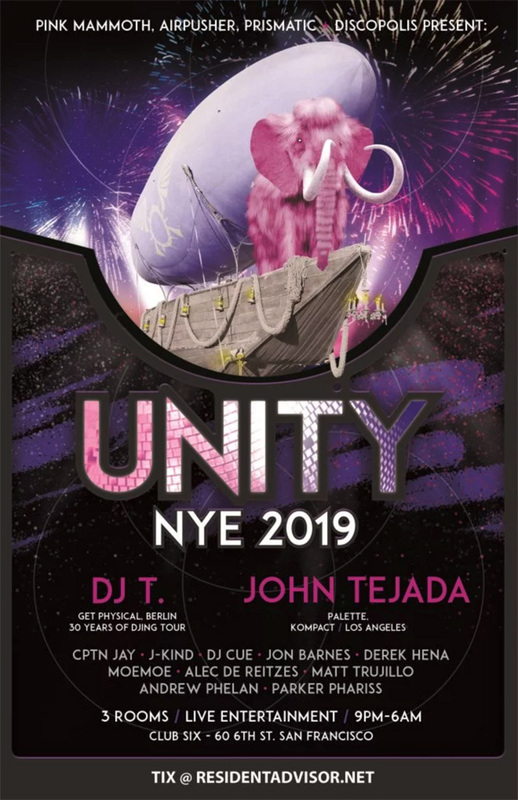 4 of SF's most seasoned and beloved crews join forces to create a NYE all-night spree with friends, family, and fans to ring in the new year in a formidable, tantalizing, and safe iconic venue. 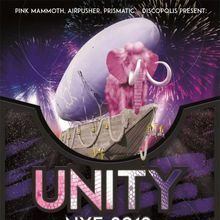 Pink Mammoth, Prismatic, Airpusher, and Discopolis present UNITY NYE 2019, a booty-shakin, soul-affirming celebration featuring 2 of the world's most renowned deep house music artists headlining this special event. Berlin's DJ T (Get Physical) who is celebrating his 30 years of Djing world tour graces the decks alongside veteran John Tejada, a man recognized as one of the seminal and influential figures of modern house music as we know it today. With support from resident Djs from Pink Mammoth, Prismatic, Airpusher, and Discopolis on 2 dance floors, a chill space, LIVE entertainers spicing up the night, lasers, lights, complimentary bites of food, and good vibes, this is one NYE celebration for the record books, all while not breaking the bank! ***A portion of all ticket proceeds will go to helping wildfire victims of Butte County and at the box office there will be means for anyone to donate directly to fire victims on the night of the event. Also, for this event there will be 2 BALL DROPS with countdowns! One will occur at 12am, and a 2nd will take place at 3am to commemorate deserted Pacific islands as they celebrate the new year. This event is 21+ with ID.